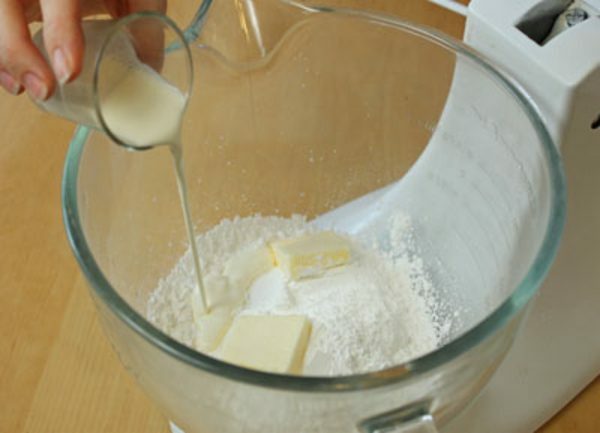 In a mixing bowl, combine the powdered sugar, butter, peppermint extract, and cream. Beat them with a paddle attachment until the mixture comes together. 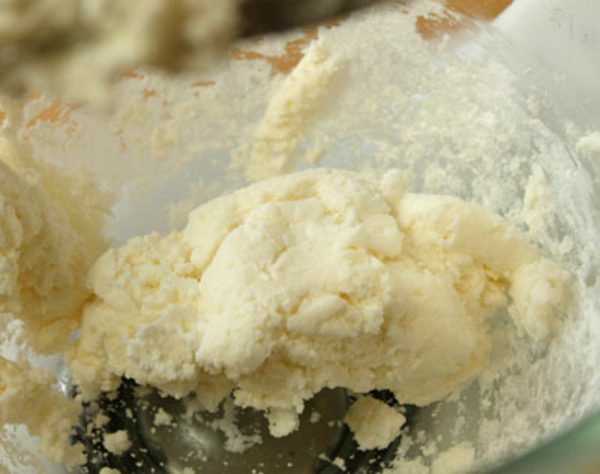 Don’t be alarmed if it looks like this at first–it will be dry and crumbly as you start mixing it. 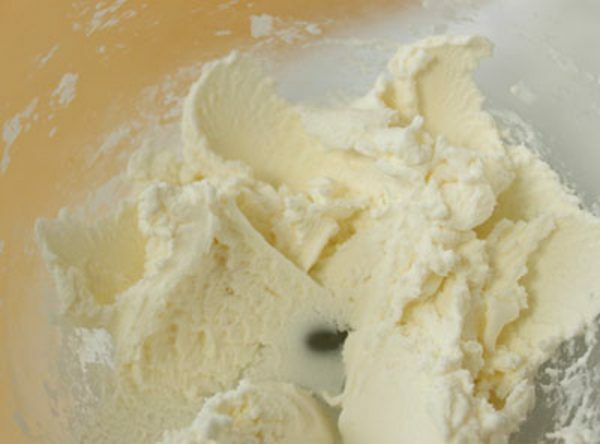 Turn the mixer speed higher and beat until the candy comes together and is light and creamy. When you touch it, it should be soft but not at all sticky. If it seems sticky, add a little more powdered sugar, a few tablespoons at a time, until it’s no longer sticky. It should be very stiff, like Play-Doh. 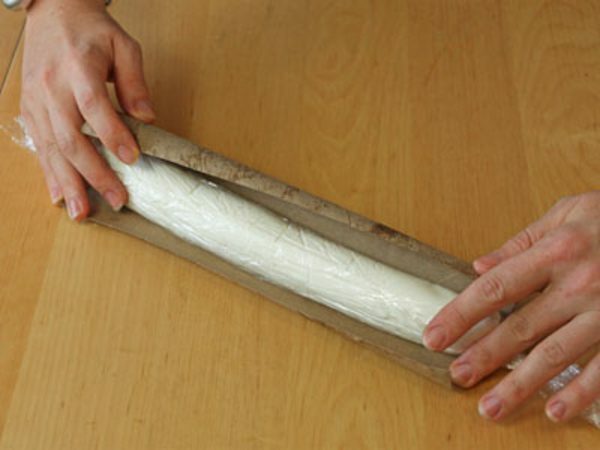 Scrape the candy paste out onto a long piece of cling wrap, and form it into a thin tube, about 1 1/2 inch in diameter. 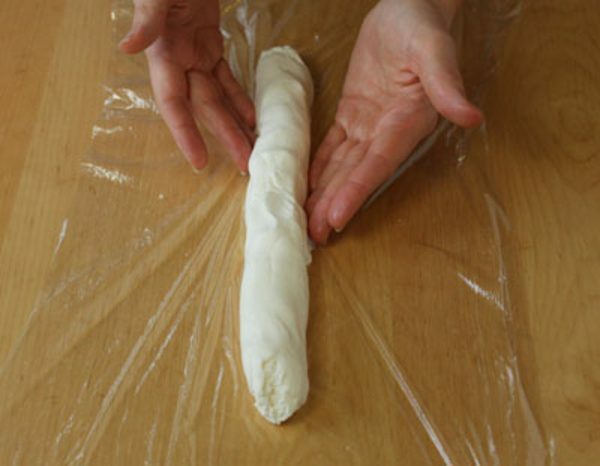 Wrap it well in cling wrap and twist the ends so that it stays in place. This step is optional, but it’s a nice trick I’ve learned. To keep your candy round on the bottom, cut a slit in an old cardboard paper towel tube, and put the candy inside. This will help keep the bottom from flattening as it sits in the refrigerator. This also works for rolls of cookie dough! Chill the candy until it is very firm, about 45 minutes. 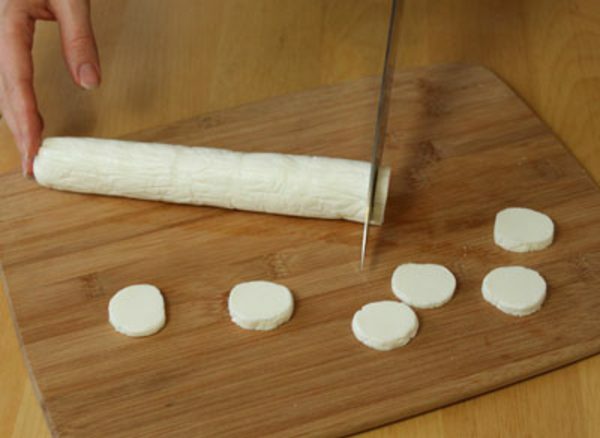 Once firm, use a large sharp knife to slice off rounds about 1/4 inch thick. You should get about 36 candies from this recipe. 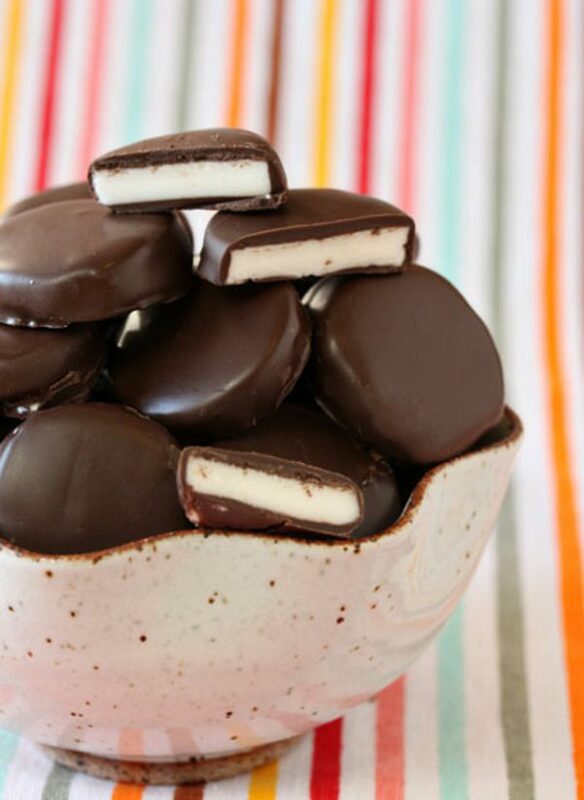 Melt the Melting Chocolate Wafers in the microwave. Melt in 30-second increments, stirring after every 30 seconds to prevent overheating. 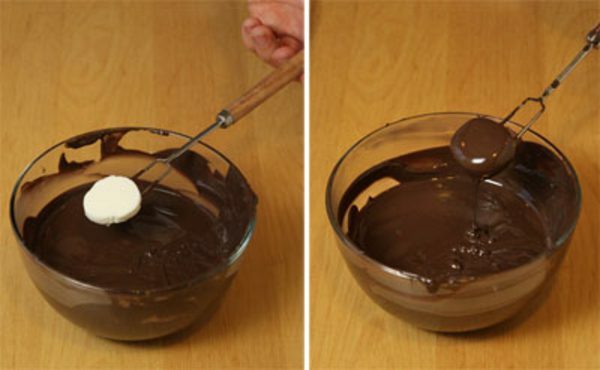 Use a fork or dipping tools to dip a patty completely into the melted coating. (I like to drop it in, put the fork under it, flip it upside down, and then flip it again so the fork is on the bottom and bring it up out of the coating. 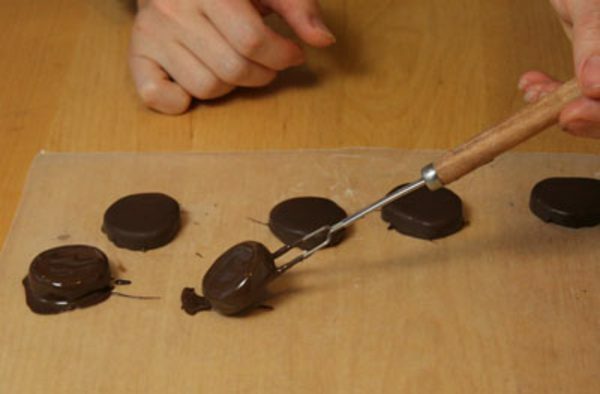 I think the flipping method is easier than pushing the candy down into the chocolate and then fishing it out again.) Let the excess coating drip back into the bowl. 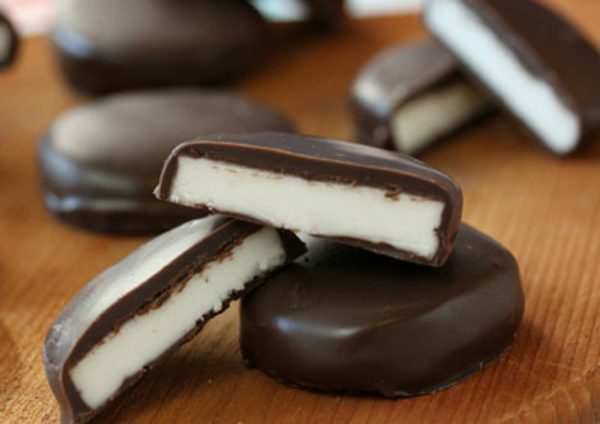 Set the dipped peppermint patty onto a piece of parchment or waxed paper, and repeat the dipping process with the remaining peppermint patties. If they get too soft to dip, chill them briefly in the refrigerator until they’re firm again. Let the patties set at room temperature. The great thing about using Melting Chocolate Wafers is that they always set quickly at room temperature, and always produce a nice shiny coating! If desired, you can trim any uneven edges or “feet” from your candies once they’ve set. 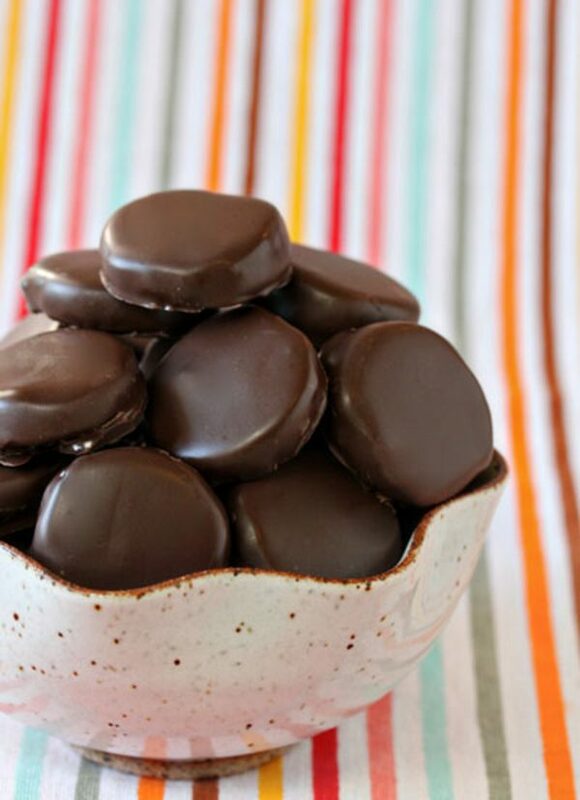 Store your homemade peppermint patties in an airtight container at room temperature for up to two weeks. These are so tasty, I doubt they’ll last that long! You can also use them in baking recipes, just like you would store-bought patties. Try chopping them up and adding them to brownies, cookies, or cupcakes. Another fun variation is to change the flavor of extract to make different flavored centers. Try vanilla, almond, or coconut! You’ll find that the creamy texture and chocolate coating goes well with everything.